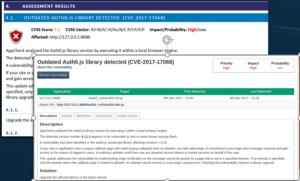 AppCheck Discovers Vulnerability in Auth0 Library (CVE-2017-17068). Auth0 provides authentication solutions for a variety of platforms including the ability to integrate social media authentication into an application. User selects to authenticate via Facebook and triggers a pop-up window to the Facebook login flow. The Facebook OAuth authentication process is completed and an access token is generated. The pop-up window passes the access token back to the requesting site using HTML5 postMessage. This token is then used to authenticate the user. A vulnerability occurs since the origin and target of postMessage events between the pop-up window and the requesting page are not validated. i.e. Message event handlers will process messages from, and reply to, any website that submits the event. 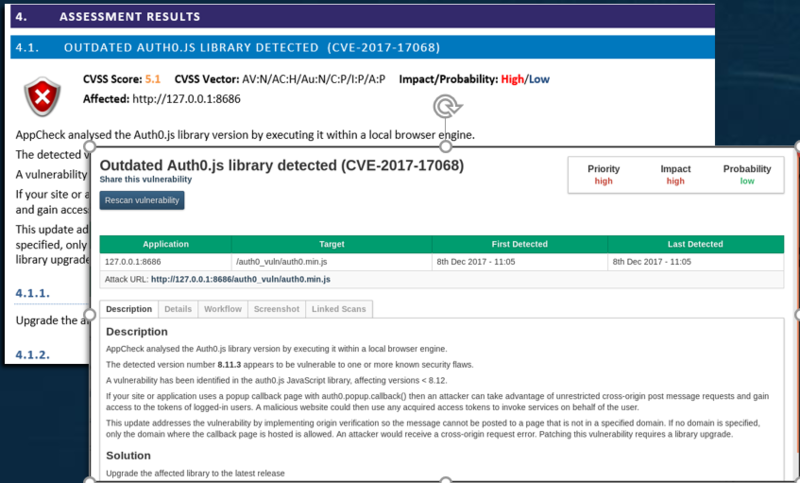 It is therefore possible for a malicious web page to open a pop-up for an authenticated user and intercept the sensitive access token. The attacker could use the token to then carry out actions on behalf of the user or read sensitive user information. Developers using the auth0.js library need to upgrade to the latest version: 8.12.
var auth_url = "https://<target URL>/authorize?client_id=<client_id>&response_type=token&connection=facebook...."